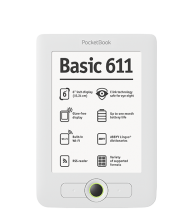 PocketBook Basic 611 is a compact multifunctional e-reader by attractive affordable price. All conditions for comfortable reading in a stylish and simple design. The best qualities of this e-reader go perfectly with its little weight. The device fits very comfortably in your hand. Keys placement and their dimensions ensure easy and simple device control. The PocketBook Basic 611 display is based on E Ink e-paper technology. This revolutionary technology is defined by maximum visual similarity between the display of the E Ink device and a paper page: the display is inactive, only indirect light is used. The screen, 6" E Ink® Vizplex, 166 dpi, with a resolution of 800x600 pixels, supports 16 grey gradations which allows the display of complex texts and illustrations. Owners of PocketBook Basic 611 will have no difficulty with aspect angles or glare in the sunshine. You can read books in the electronic PocketBook reader even on the sunniest day. If necessary, the refresh mode can be activated without blacking out the screen, enabling this feature in settings. 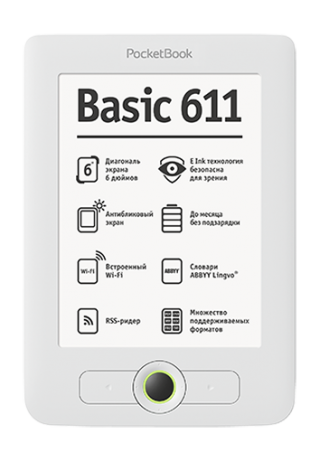 PocketBook Basic 611 electronic readers provide fast Internet access. You can access the Internet in cafes, hotels, airports and other public places through Wi-Fi based on a built-in WLAN 802.11 b/g module. The feature for setting up how your text is displayed helps create the level of reading comfort that suits you personally. Choose from ten built-in fonts and, if you want, add others that you like. Change font size, line spacing, field width, hyphenation and other text format settings to enhance your reading experience many times over. The capacity of the built-in lithium-ion polymer battery is 1000 mAh. Once charged, the battery will be sufficient for reading 8,000 pages. The device can work for one month without recharging, provided the built-in Wi-Fi module is off. PocketBook Basic 611 is distinguished by its support of multiple formats customary for all PocketBook devices. The device supports 14 text formats - PDF (ADOBE DRM), EPUB (ADOBE DRM), PDF, EPUB, FB2, TXT, DJVU, RTF, HTML, CHM, DOC, DOCX, TCR, FB2.ZIP and four graphic ones - JPEG, BMP, PNG, TIFF. PocketBook Basic 611 works on an 800 MHz Freescale processor that supports a large variety of functions necessary for new-generation mobile equipment, including Wi-Fi and USB. In addition, the device has a built-in RAM of 128 MB which makes the 611 model an impressive sprinter among readers.